ISLAMABAD, Aug 9 (APP): Prime Minister Muhammad Nawaz Sharif Tuesday said it was an obligation for him to become the voice of Kashmiris who were being oppressed in the Indian Occupied Kashmir (IOK). “I will leave no stone unturned to make the world understand the plight and the legitimate struggle of the people of Kashmir,” he said. The Prime Minister was chairing a preparatory meeting on the United Nations General Assembly UNGA at here at the PM House, said a press release. He observed that denial to right of self-determination for Kashmiris in the IOK was one of the persistent failures of the United Nations. The right of self-determination was the basic right of the Kashmiris, he said, adding that they would make every effort to support the Kashmirs in IOK to achieve their goal. 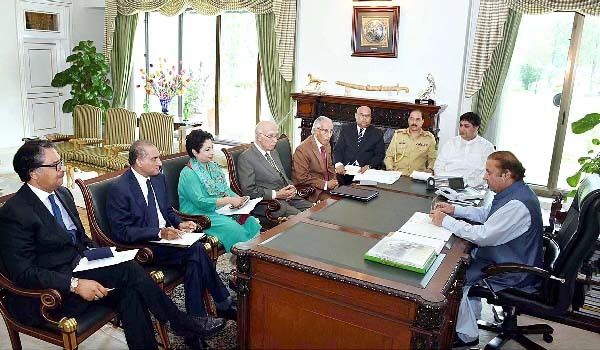 Advisor to PM on Foreign Affairs Sartaj Aziz, Special Assistant to PM Tariq Fatemi and Foreign Secretary Aizaz Ahmed Chaudhry, Pakistan’s Permanent Representative in the UN Dr Maliha Lodhi, Pakistan’s Ambassador to the United States Jalil Abbass Jilani and other senior officials attend the meeting. The meeting reviewed the agendas to be included in the next session of the United Nations General Assembly in which the Prime Minister was expected to participate. It observed that Kashmir remained an unfinished agenda of the United Nations and accordingly, India must realize that Kashmir was not its internal matter, rather it was a matter of regional and international concern.